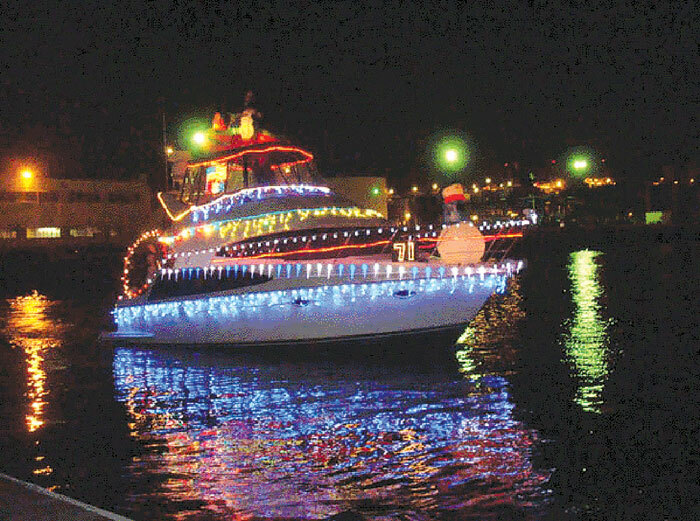 SAN PEDRO — The 50th annual Los Angeles Harbor Holiday Afloat Parade will kick off Southern California’s holiday boat parade season, starting at 6 p.m. Dec. 1 in Los Angeles Harbor’s main channel. Local officials and community leaders will take part in the parade as judges or passengers on the 60-plus decorated parade boats expected to participate in this year’s event. This year’s grand marshal is 15th District Councilman Joe Buscaino. Vessels of all shapes and sizes will participate in the event, including powerboats, sailboats, tall ships and harbor working craft. Boaters can enter the parade by paying a $30 entry fee and registering online at laharborholidayafloat.org, no later than Nov. 30. The entry fee includes one admission to a Parade Awards Brunch Dec. 2 at the Doubletree Hotel. Advance tickets for the Awards Brunch are $20; $25 at the door. Boats will compete for trophies in the following categories: Theme, Traditional, Humorous, Holiday Spirit, Best Animation, Commercial, Most Original, Children’s Choice, Judge’s Choice and Grand Marshal’s Award. Yacht Clubs will be vying for a Perpetual Trophy awarded to the club with the most entries. The parade starts in the East Basin near Banning’s Landing Community Center in Wilmington. The procession of boats will take about 90 minutes to cover the entire parade route up the port’s main channel. Spectators can view the procession from several points along the port’s main channel, including Banning’s Landing Community Center, 100 E. Water St.; USS Iowa, 250 S. Harbor Blvd. ; Los Angeles Maritime Museum, 600 Sampson Way; Ports O’ Call Village, 1100 Nagoya Way; the Cruise Ship Promenade at Harbor Boulevard and Swinford Street; 22nd Street Landing, 141 W. 22nd St.; SS Lane Victory, Berth 46 at the end of Miner Street; and Cabrillo Marina, 200 Whaler’s Walk. Spectators are invited to enjoy festive pre-parade events beginning at 3 p.m. at Banning’s Landing Community Center and a post-parade Fanfare Fountain holiday program at 8 p.m. at the entrance to the World Cruise Center. For more parade information, sponsorship information or Awards Brunch tickets, visit the website or contact Donna Ethington at (310) 549-8111.